CEO Jason Noland has hosted several webinars for Girl Scout Councils on Faith-Based Initiatives or “FBI.” The trainings have been for council staff as well as for volunteers. The presentations focus on the religious awards programs and how Girl Scout Councils can leverage them as tools for membership, not just for program. Interested in growing membership in your council through the faith community? Visit P.R.A.Y.’s FBI page or contact Jason directly. CEO Jason Noland and Associate Director Deb Hazlewood will represent P.R.A.Y. at the National Girl Scout Convention in Columbus, OH. P.R.A.Y. will have a booth in the exhibit hall with resources for both volunteers and professionals and an interactive game for girls. Our promotions will focus on the Faith Based Initiative (FBI) Membership resources, the P.R.A.Y. Award series for Protestant and Independent Christian Churches, and the Bible Basics RP3 patch series. Make plans to visit the P.R.A.Y. booth in October. 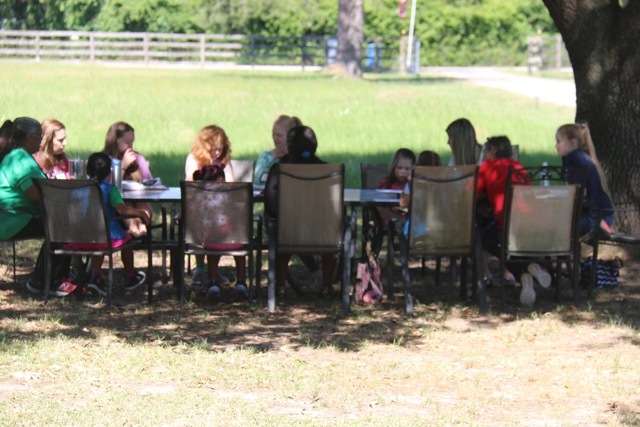 Members of Good Shepherd United Methodist Church planned a Girl Scout Religious Badge Encampment for the Heart of Texas community in Cypress, TX in the San Jacinto Girl Scout Council (Houston and surrounding areas) on May 12-13, 2017. Twenty-three Girl Scouts from grades Kindergarten through 10th grade (and their Moms!) participated in a My Promise, My Faith encampment earning both their Girl Scout pin and “The Good Book” Bible Patch from P.R.A.Y. The weekend included an optional overnight event on Friday to pitch tents and enjoy mother/daughter games and activities, and the actual program was led on Saturday. The program was a unique combination of the Girl Scout “My Promise, My Faith” pin and the “Bible Basics RP3” patch series. The program outline was created by P.R.A.Y. to provide churches with a resource to work with the Girl Scouts. According to Susan Lawyer, UMC Scouting Ministry Specialist, “Basically, I followed the template all the way…We combined “Respect Authority” line of the GS Law and “The Good Book” patch, divided the moms and daughters into 3 groups, and worked through the patch.” Visit P.R.A.Y.’s Community Hub to read highlights of the program (you may also post questions or add comments to share with others). Please visit the P.R.A.Y. website for the sample template and a chart of RP3 patches. 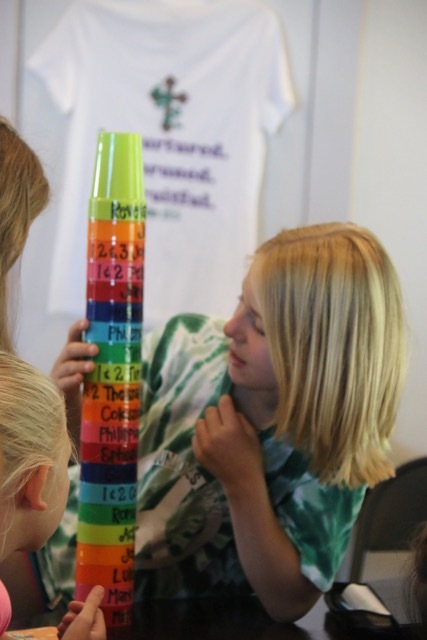 13 Girl Scouts from Conover First United Methodist Church in Conover, NC participated in the God and Me and God and Family programs this spring. In God and Me, girls made GAMEBoxes and learned about “Best Friends with Jesus,” and in God and Family, girls made family pizzas and learned about “Growing in God’s Love.” Pictured are Ava Grace, Ivy, Laci, Rachel and Regan along with Rev. Charmaigne Van Rooyen, associate pastor who taught the classes. 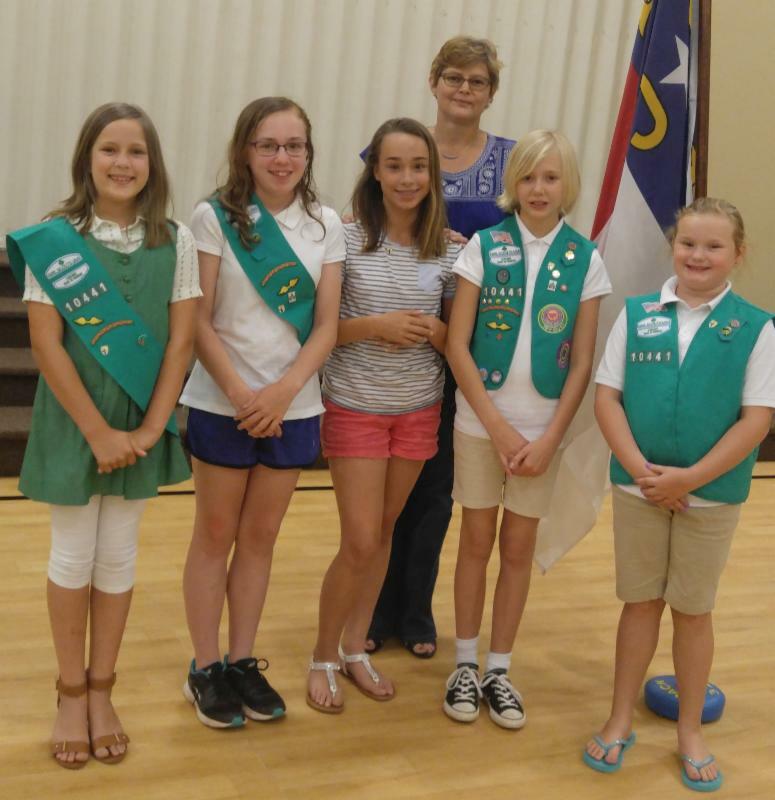 The Girl Scout Troop is part of a larger Scouting ministry of Conover First UMC, and indeed part of their outreach ministry. Thanks to Girl Scout leader Debbie Moritz for providing a picture. P.R.A.Y. keeps a national registry of all P.R.A.Y. award recipients and notifies each council of the girls (and their churches) that participate in these awards programs. Usage figures for the first six months have been posted online. Each council can see the number of P.R.A.Y. award recipients and the percentage increase or decrease compared to last year. Please note that these numbers include only the P.R.A.Y. awards for Protestant and Independent Christian churches. Thank you for helping Girl Scouts fulfill their promise To Serve God.